The old coal/goods shed, the last remaining Southwold Railway building left on the planet. This building was built around the late 1870s for the station at Blythburgh. 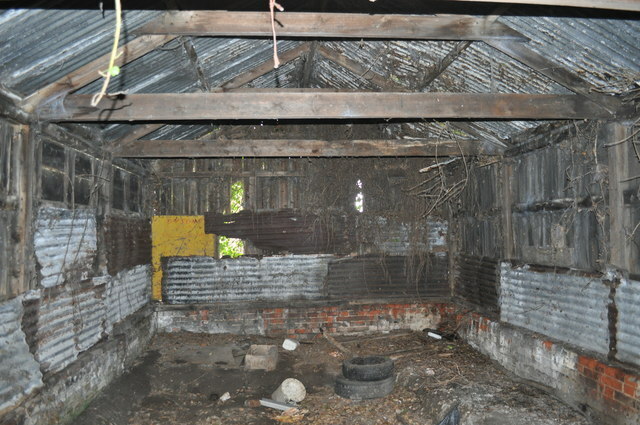 It is of wooden construction, thus it is in a very poor state with rot and brambles. The railway was narrow gauge at 3ft, running from Southwold to Halesworth (8.75 miles). After road competition and a run down of trade the board cut their losses and closed the line in 1929. Track was ripped up in the second world war. The Southwold railway was a small 3ft branch line running from Halesworth to Southwold, Suffolk. The once-important harbour at the town declined during the 18th and 19th centuries while Lowestoft, a few miles north grew considerably. The East Suffolk railway, which had been incorporated on 3 July 1854, took over the powers of the Halesworth, Beccles & Haddiscoe Railway, the line opening 4 December 1854. The extension north to Great Yarmouth and south to Ipswich (and London) opened 1 June 1859. There were only 9 miles between Halesworth and Southwold. A once-daily horse-drawn bus service to Darsham was inadequate and considered a failure. The ESR (later the GER) refused requests from residents for a branch line, so by 1875 the Southwold Railway Company was formed with the help of local people (many of whom bought shares). A gauge of 3ft was chosen to save costs but conversion to standard gauge was a future option. There were troubles raising capital and the board changed from a Halesworth based board to a London one. In the end the 8 1/2 mile line opened on the 24th September 1879. There were stations at Halesworth, Wenhaston, Blythburh, Walberswick and Southwold. Starting out at Southwold Link the line passed level ground before entering a deep cutting Link a bridge over the cutting can still be seen with reused rails Link . Curving southwards over the Southwold marshes, by 1914 there was a small branch to the harbour. Link . The railway climbed a little before running over the swingbridge, the piers still remain Link . The footbridge was blown up as a war deterrent during the second world war. A large embankment was built over the marshes before entering Walbersick station Link . After leaving the station a long cutting Link took the train through the common, over a cattle grid Link before evening out to level ground Link . The next stretch was a bit more difficult to build with many more cuttings and embankments Link Link . Passing through the conifers of the 'Herony'. After exiting a deep cutting Link and passing over a large embankment Link the gradient gently took the line down to Bylthburgh marshes Link . The track was low here and suffered flooding Link . Some track still remains where a WW2 gun emplacement buried it Link . At Blythburgh a bridge took the A12 over before entering the station. Link the only remaining SR building remaining is the old coal shed Link before continuing further inland Link . From here the trackbed is private, passing Laurel farm before reaching Wenhaston Link Link . Again the trackbed is private but at Halesworth it is walkable. Passing the old engine shed Link and quarry before running over Birds Folly bridge Link . The line then crossed a girder bridge (demolished) and headed towards the joint station at Halesworth Link . At the opening, the Southwold Railway had three engines manufactured by Sharp, Stewart & Co. Ltd of Manchester. The 2-4-0Ts were called ‘Southwold’, ‘Halesworth’ and 'Blyth' but due to low traffic levels at the start No 1 Southwold was returned to Stewart & Co. Ltd in 1883; to be replaced later (in 1893) with a 2-4-2T again called Southwold. In 1914 a much larger Manning Wardle 0-6-2T was purchased due to the construction of the Harbour Branch. The stock book included six 6-wheel coaches, 6-wheel coal trucks (some owned by Thomas Moy Link 2 goods vans and a selection of 4-wheel trucks. One of the goods vehicles is preserved at the East Anglian Transport museum. The Southwold Railway gradually developed, eventually in 1900 the line carried 10,000 passengers, 90,000 tons of minerals and 600 tons of general freight. The proposal for conversion to standard gauge was followed but finance prevented this. After the First World War and the collapse of the fishing trade along with national financial depression caused a general decline in the fortunes of the line. Up to 1925 the line showed a profit, with motor-buses services starting in 1926 the railway responded with more services at cheaper prices, unfortunately the directors eventually gave up and decided to cut their losses. Closing the line on April 11th 1929, after one week’s notice. When closed, stock was just left to rot at Halesworth. Scrap metal recovery for the Second World War provoked a last-ditch attempt to save the line which failed, July 1941 saw the line and engines cut up for scrap. Nowadays the Southwold Railway Society (SRS), along with Southwold museum keep the little line in peoples memory. The SRS are planning a 1 mile line near Laurel farm, Wenhaston. They are also building a replica of Blyth. © Copyright Ashley Dace and licensed for reuse under this Creative Commons Licence.